Value of card: "Ninety percent of the value is half of nothing," Berra said. "You could observe a lot by watching this group. Well, maybe not." "It ain't over till it's over, unless we're talking about our World Series chances, which are over." "Watching this team lose is deja vu all over again." "Nobody comes to the Astrodome anymore. It's too crowded." "This team is a bunch of overwhelming underdogs. Make that underwhelming overdogs." "They made too many wrong mistakes." Really? 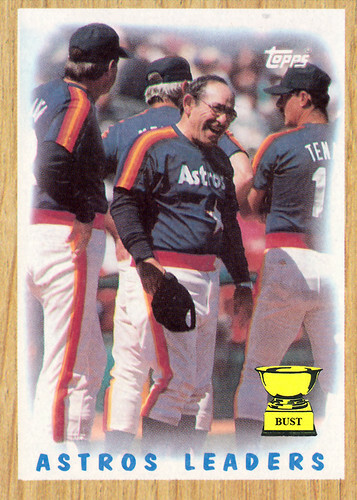 Amazing that Berra didn't know anything about the 1985-1986 Astros. They were awesome. The Astrodome, however, was iffy. Hitters must have felt like they were trying to hit a home run from one side of the Pentagon to the other. And owner John McMullen's "redcoats" ("ushers" and "aisle monitors" - older men acting like that certain type of golf course marshal every single second, sucking the fun out of every game).